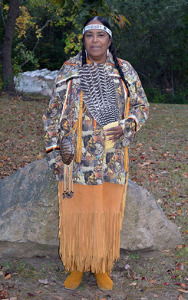 I am currently serving as Treasurer; I was elected to the Tribal Election Committee where I sat for 5 years. I also was a member of the Social Service and Pow-Wow Committee and currently hold the position of the Liaison to the Youth Committee. I am a past member of the Martin Luther King Center in Norwich where I sat for 6 years. I have a BA in Applied Social Relations from Eastern CT State University. I served in United States Army in the Intelligence field for 4 years, where I received the rank of Sgt. I have been employed as a Social Worker with the Department of Children and Families for 17 years. I feel my greatest accomplishments are my two Children, Natasha and Tyrone Gambrell and my Granddaughter Taliyah. My life goal is to help regain our Federal Recognition for the Tribe.